Chef Caps ~ Beanies ~ Bakers Hats. High Quality Chef Skull Caps and Pillbox caps made in America. These great looking skull caps are made from a 100% cotton fabric that is lightweight and very soft. They cloth is reactive dyed and printed, which means that the colors will not fade. They are designed to fit any size head with their elastic head band. And, they're also designed to help keep you cool in the kitchen, by fitting the inside of the headband with soft and absorbent terry cloth. This inner band helps absorb moisture in those hot kitchens! These hats have style and color at a great price and are made in the US with pride and care. Read more about the chef caps. When you like to change up your head wear, and want to get a great deal - these combo packs are a good bet. Each color striped combo pack has 1 of each of the 4 striped designs. 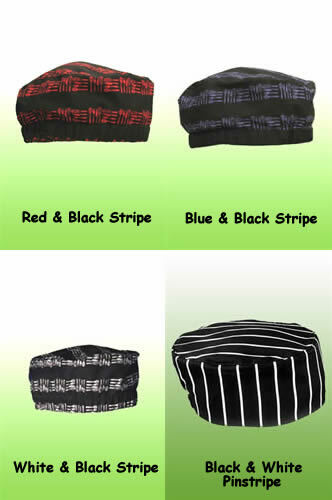 So, you get a skull cap in blue and black striped, red and black striped, white and black striped, and black and white pinstripe. All our beanies, as they're also called, are made in the USA from 100% cotton fabric. The fabric is lightweight and soft. The interior elastic head band ensures that one size fits all. There's an inside band of nice soft terry cloth that helps to absorb perspiration. Buy a pack of 4 and split them with the kitchen staff. Hey, at least you'll all look good! Read more about the skull caps. These sharp looking baseball caps are made out of 100% brushed cotton fabric. They are crafted with six panels and have an adjustable strap at the back. To help keep you cool, there are brass grommets on the sides. 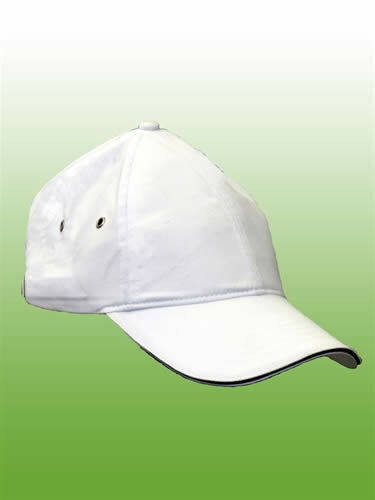 The white cap has black trim piping in the bill and the black cap has white piping in the bill. These are nice, well made hats that work equally well in the kitchen or outside. And, it's a baseball hat made in America – what a thought! * Love these chef caps but live outside the US? Contact us, tell us where you live and what you want to buy and we'll send you an exact shipping quote. Are you tired of buying cheap imported chef caps? Or perhaps you're tired of themn falling apart after 2 washings? All chef caps, and the fabric they are made out of, are NOT equal. These caps are made with care and pride in the US. The fabric is 100% cotton, and it's lightweight and soft. Consider giving these a try next time you're in the market to replace your headwear.